We’ve collected 237 promotional and marketing ideas you can use within the four walls of your restaurant. Many of them can be implemented today. 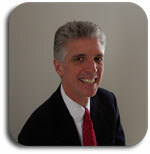 Restaurant marketing is a moving target. With very few exceptions, what’s effective one month may be less so the following month. That’s why it pays to keep a big pot of marketing ideas simmering. When you have many marketing techniques and sales ideas working for you, your business is more stable. You’re not susceptible to downswings in revenue should one or two of your tactics lose their punch. 1. Pick one idea from the book and implement it. Commit to implementing one idea per month, or per week. If you implement one idea a week, you’ll have 52 new marketing ideas working for your restaurant by the end of year one. 2. Use it as a brainstorming resource. Ask your key staff members to each take one idea and brainstorm it ten different ways. There is no right or wrong. If you have twenty people do that, you now have 200 ideas related to one topic. 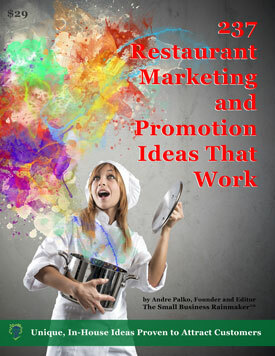 Or have them go through the book and pick out ten ideas they like, customized for your restaurant. Sure, some will overlap, but you now have an idea-generating machine at work. There is bound to be one good one in the mix. You’re busy running your restaurant so time is precious. This time-saving resource adds stability to your business and increase revenue and profit. Every idea in this book has been tested and proven in the real world. They’ve come to us from experienced restaurateurs and consultants from around the world, both inside and outside the industry. Of course, not every idea is for every restaurant. Yet there is indeed something profitable here for everyone, including you. Your restaurant can easily profit when you implement at least one or more of these proven tactics. We know because we’ve seen these ideas at work in the real world. We understand you might not know us that well. Or maybe you’re just getting to know us through our Small Business Rainmaker newsletter or our Marketing Blog. So we want to put your mind at ease with our No-Risk, 90 Day, 100% Money-Back Performance Guarantee. If after using this book for 90 days you feel it’s not worth the $7 investment, send us an email and we’ll promptly and courteously refund your $7. Plus, you get to keep the book. In addition, if you implement these ideas and don’t earn at least 100 times your investment in 90 days or less, we’ll promptly and courteously refund your $7 purchase price. Yes, we promise you 100 times return on your investment or your money back. However you look at this, you’re covered. But just in case you’re hesitant, here’s one more incentive to make it worth your while. With your purchase, we’ll also give you a FREE copy of Grow Your Captive Audience with Facebook Pages. Whether you already have an established Facebook company page, or are just starting one for your restaurant, this ebook will guide you. In this guide we share highly effective Facebook Page Strategies that will grow your audience and increase engagement with your fans. ⇒ How to use Facebook Advertising to target your ideal audience to get more likes, and more importantly, more customers. ⇒ How interacting in Facebook Groups can help bring prospects to your Facebook Page. ⇒ How to use Facebook Live on your Facebook Business Page to reach your ideal audience every day. ⇒ How to use content to grow your audience, increase engagement, and convert prospects to customers. Simply scroll down to the order button to get 237 Restaurant Marketing and Promotion Ideas That Work, and we’ll include Grow Your Captive Audience with Facebook Pages for free. Not a bad deal for 7 bucks! There’s no catch, either. It’s part of our commitment here at the Small Business Rainmaker to offer great content to small businesses everywhere. Once you order, you’ll get an automated email with a link to download both books. That usually arrives in just a few minutes, so you can get started right away. You’ll see that the book has a $29 price tag on it. 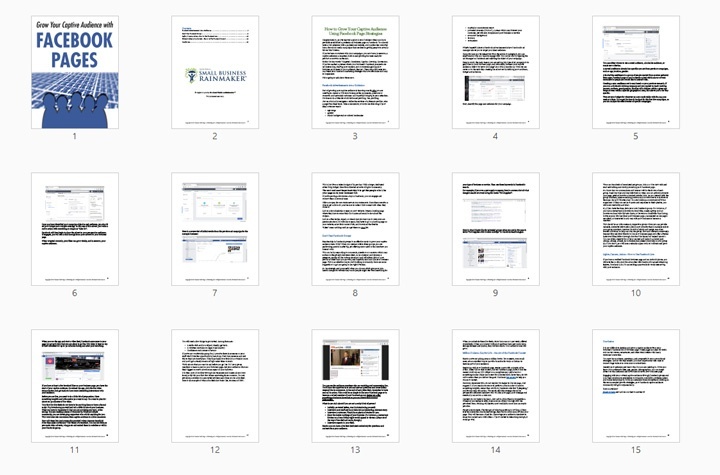 Today’s $7 price is part of some marketing tests we’re running with an entire series of ebooks. This is the lowest price point for this book and it’s only available until the next price (higher) starts testing. My point—take advantage of the low price point today! It’s only going to go higher. 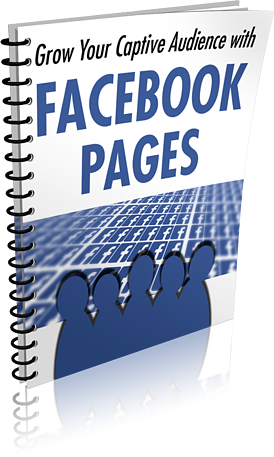 Go here to claim your 237 Restaurant Marketing Ideas and the Free Bonus, Facebook Company pages book.